Offered here is a fascinating original Victorian bodice top. 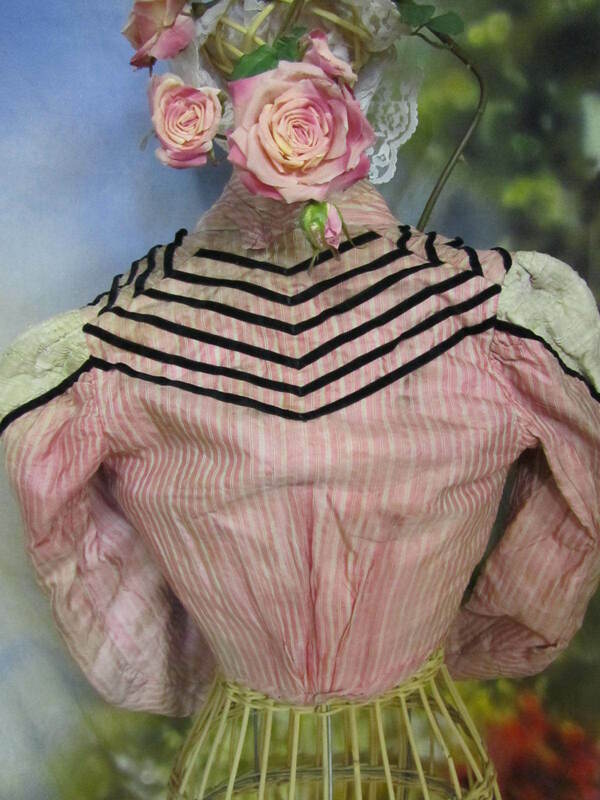 This is made with an undergarment lining which is boned like a corset,this is a sturdy cotton muslin, has a linen texture and weave in a pale pink tone. 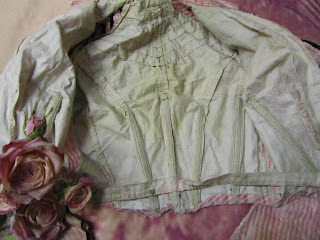 This is fitted and has the original hook and eyes, fully lined including the sleeves. 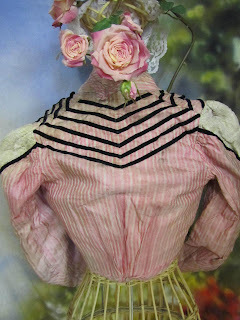 Over this is a bodice of pure silk, this is a ribbon silk with a pink stripe and cream color raised cording running through the material. The silk bodice is cut blouson in the front, has a full ruffle cascading to the hem that is edged with black velvet ribbon. The blouse has a stand up collar and a sheer silk piece that wraps around at the neck and snaps in the back. 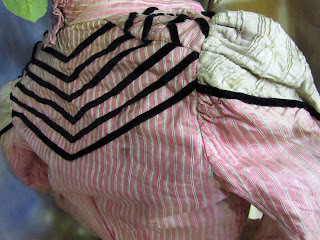 The upper bodice has rows of velvet ribbon, the shoulder has inserts of cream material with tiny 1/32 to 1/8" pin tucks. This is all original and over 130 years old! 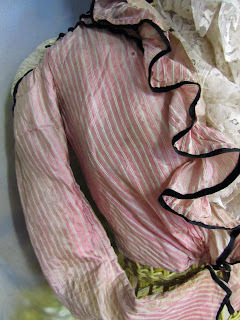 Very rare that this fragile fabric has survived over the centuries, hard to find Victorian pieces in colors at all. 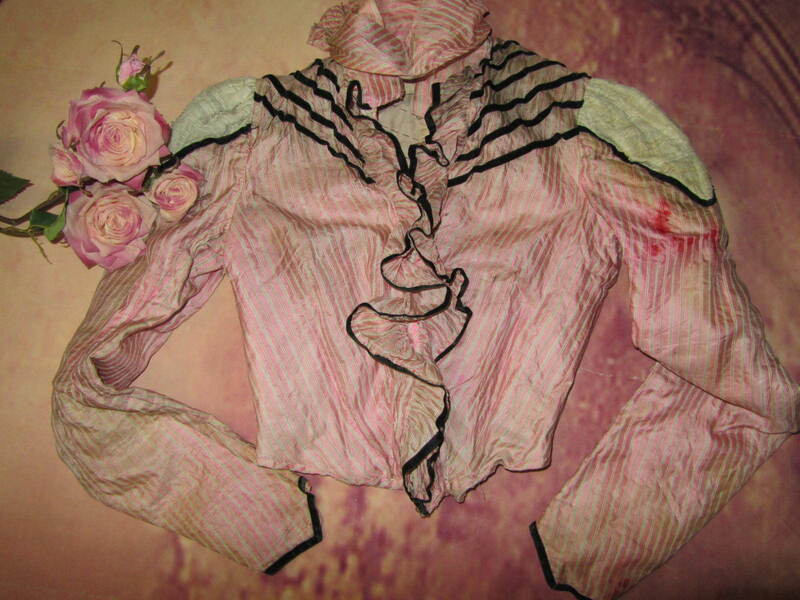 It it truly remarkable for the age, the silk is not deteriorated and very good for the delicate nature of this material, a little fraying on the sleeves, there is some variation in tone. 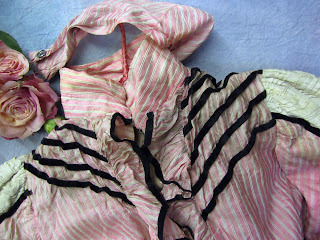 The size is extra small, measures; waist 24", bust 32", length center front from top of collar to hem point 17". 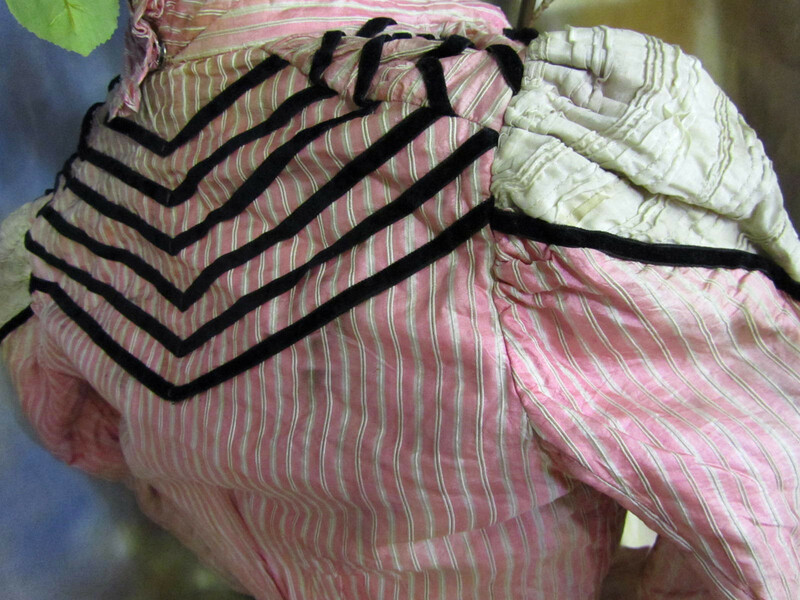 The only real damage is that there is a 'reddish' area on one sleeve on the upper part and a smaller area at the cuff of that sleeve, this looks like it maybe from the dye in the garment laying over the years, maybe something laid on it. Could be covered with some lace appliques if desired. There is also one row of velvet ribbon trim missing on one side of the front. The color in the inside seams is a bright pink. The fabric is just incredible, the silk has a narrow cream stripe then it is set off by the corded raised thread that runs through it. Should be in a museum, the condition is antique but remarkable for the age. 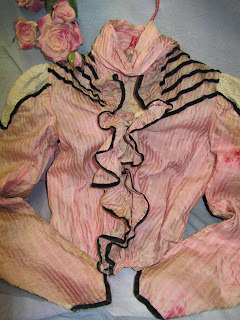 I would not recommend it to be worn, should be used for display or fabric. This is a genuine piece of history. Not quite 130 years old - more like 115 or so. Don't want to age the old girl too much!